Edited, introduced and annotated by Cedric Watts, M.A., Ph.D., Emeritus Professor of English, University of Sussex. The Wordsworth Classics' Shakespeare's Series presents a newly-edited sequence of William Shakespeare's works. The textual editing takes account of recent scholarship while giving the material a careful reappraisal. 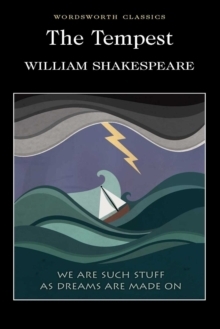 The Tempest is the most lyrical, profound and fascinating of Shakespeare's late comedies. Prospero, long exiled from Italy with his daughter Miranda, seeks to use his magical powers to defeat his former enemies. Eventually, having proved merciful, he divests himself of that magic, his `art', and prepares to return to the mainland. The Tempest has often been regarded as Shakespeare's `farewell to the stage' before his retirement. In the past, critics emphasised the romantically beautiful features of The Tempest, seeing it as an imaginative fantasia. In recent decades, however, The Tempest has also been treated as a potently political drama which offers controversial insights into colonialism and racism. Frequently staged and diversely filmed, the play has influenced numerous poets and novelists.